BS EN 1729 Part 1 - Functional Dimensions. BS EN 1729 Part 2 - Safety Requirements and Test Methods. While most existing school furniture will pass BS EN 1729 Part 2, the fundamental changes to compliant furniture design are in BS EN 1729 Part 1 which relates to the appropriate size, shape and ergonomic design of classroom furniture to maintain good posture and reduce RSI and back pain in school children. To ensure you purchase the most accurate height furniture for the individual child in compliance with the standards, we recommend that you measure the stature and popliteal height of the child. You can then match those measurements with the following sizemark guide. 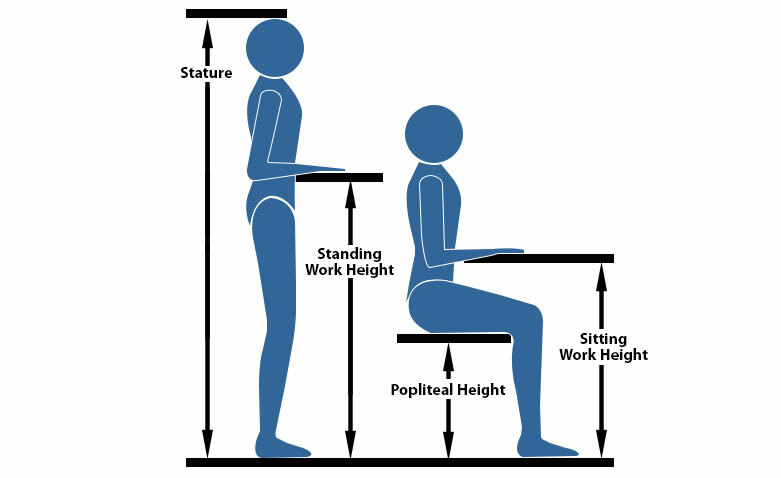 Sitting work height defines the correct table height. The measurement is determined by sitting elbow height, which is the distance from the floor to the underside of the elbow whilst sitting with the upper arm vertical and the lower arm horizontal. Standing work height defines the correct standing table height. The measurement is determined by standing elbow height, which is the distance from the floor to the underside of the elbow of a standing person with the upper arm vertical and lower arm horizontal. Furniture Standards Guide - Match Your Table Height To Your Chair Height.